There has been a growing upheaval in investing as we throw out overused theories and reintroduce behavior, redefine risk, and question labels that have been used for decades. None of this is new. It was simply written off and ignored for a perfect and faulty efficient market belief. 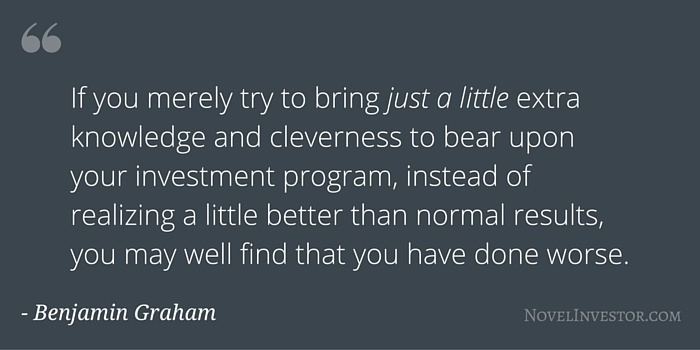 Ben Graham offered up behavior’s role in investing back in 1949 with the story of Mr. Market. After that, emotion was magically removed from the markets and common sense has finally brought it back. The dark ages weren’t all bad. It brought index funds and low-cost investing to the masses. And we shouldn’t ignore the tiny issue that masses bring more emotion to the markets, but hey, investing was never perfect. Still, we are stuck with a growing list of new labels – index and passive and momentum and… – used at a time when investing should be simplified. Notice, there’s no mention of styles, strategies, or risk profiles. Instead, Graham’s two investors are broken down by their behavior and willingness to do work. The defensive investor has limitations. That freedom from effort includes anyone who sees investing as a chore or only wants to know enough to deal with it a few times a year. Fair enough. That doesn’t make them lazy, but smart. They understand their limitations and accept it. Why spend time doing something you don’t enjoy when there are simpler solutions available. These days, index funds make things easier for the most avid defensive investors. It’s perfect for anyone more interested in anything other than the daily swings of the market. Relying on diversification and allocation are key to avoiding big losses. Most people, admittedly or not, fit his defensive definition. I’d bet 95% (maybe more?) fit this mold. They have more important or fun things to do than deal with the daily market news. It’s better for them to tune it out, visiting infrequently. That’s not to say they are all indexing or passive. There are different degrees of defensive, but the ones who are lying to themselves have a problem. Expecting average returns should be good enough. Then there is the enterprising camp. Certain circles attack the possibility that enterprising investors exist. Just follow the chorus of – Do you think you’re the next Warren Buffett? (Of course not!) It’s a great marketing tool. Take an extreme example, throw an impossibility in your face, then sell you an index fund. It’s not that people aren’t capable, they are. The problem lies with people who fool themselves into thinking they are when they’re simply imitating one on CNBC. The best investors understand their tendencies better than anyone. That’s not to say they’re impervious to mistakes. Rather, each mistake is carefully reviewed and filed away in their head. Over a lifetime, they tie dozens of ribbons around their finger as a reminder of what they can and can’t do. The smart investors accept their limitations and invest accordingly. Graham’s definitions are a far better way to group investors then by styles. Styles, by default, pigeonhole you. Rather, it’s your limitations that define the type of investor you should be. If you’re willing to put in the time and effort, you can learn to be an enterprising investor and dig into the basics of every strategy. Agility allows you to see more opportunities. Specialization can come later. But first you should learn to be a defensive investor and that it only works if your behavior allows it.